This Is Not America: Protest, Resistance, Poetics, on view now at the ASU Art Museum, gives a startlingly fresh look at the intersection of art and social change through allowing works to converse with one another. Curated by Julio César Morales, with assistance from ASU College of Liberal Arts and Sciences graduate student Indira Garcia, the three-part exhibition pairs works from the museum’s collection with those of emerging and established artists in a sort of “question and answer” format. 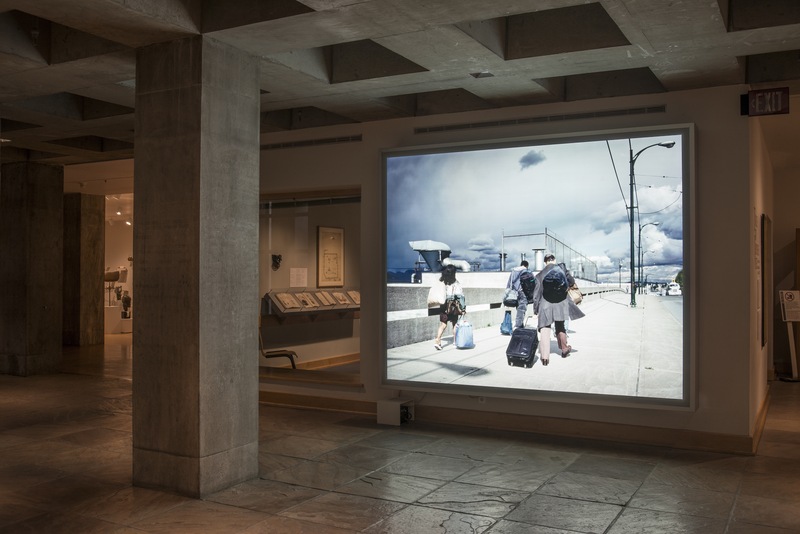 Part 1, on view now through Nov. 9, 2013, marries a painting by Cuban collective Los Carpinteros with an animated video by contemporary Seattle-based artist Paul Rucker, in an effort to “explore the power dynamics and political implications of oppression,” according to Morales. 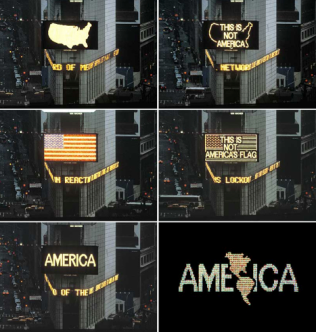 “The exhibition title takes a cue from Alfredo Jaar’s seminal 1987 public art video intervention at Times Square in New York City, A Logo for America, a three-part video animation that plays off the notions of ‘America’ and its relationship to citizenship, homeland and borders,” says Morales. On the east wall of the gallery hangs Dominar Bestias/How to Dominate Beasts, the watercolor painting by Los Carpinteros, whose name “derives from the historical term for skilled slave laborers,” according to Morales. Within the painting we are shown a number of household objects, such as dressers and chairs, shackled to a fence that corrals them, as though they were animals in a paddock. It is unclear whether they are being chained to the fence so that they do not escape, or whether it is the fence that is tied down to these material goods. One begins to wonder who or what is being dominated, and, beyond that, who or what the beasts are. Across the darkened gallery is Paul Rucker’s video piece Proliferation, projected on the wall opposite the painting. Rucker was inspired to create the piece while at a “prison issues” residency at the Blue Mountain Center in the Adirondacks, when he discovered a series of maps created by researcher Rose Heyer that showed the growth of the United States prison system over time. Rucker, a musician as well as visual artist, created the durational piece from the maps and also composed the original score. 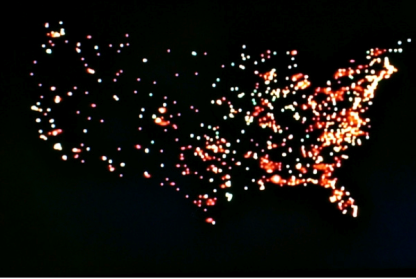 To Rucker’s score, each new prison appears on the projection as a dot of color, starting first as green specks and escalating in intensity into brilliant red and orange flashes. While viewing “Proliferation,” one is struck by how quickly the outline of the United States is formed, beginning first with New England, but quickly springing across the map to the West Coast. The colored dots, illuminated against a black background, echo other, similar maps, such as those illustrating light pollution from major cities, or urban sprawl. As the piece goes on, the green dots begin to merge, turning yellow, and the music takes on a more ominous tone. The dots appear in faster succession, sprawling across the map, until there is no one section that is free of color. They evolve from isolated flashes of yellow into orange and then red masses, joining together with sharp, jolting regularity, like explosions. One feels like a cat, mesmerized, watching a laser dart around a wall. But with this feeling of not being able to look away, to stop chasing the flashes of light, the music suggest something darker, a sinking feeling in the pit of one’s stomach. This is not a game. This is serious. The two pieces, poised opposite each other in the Americas Gallery on the second floor of the museum, both face off against one another and speak to each other. Their conversation occurs in the space between, where the viewer is invited to sit, to pace and to contemplate. 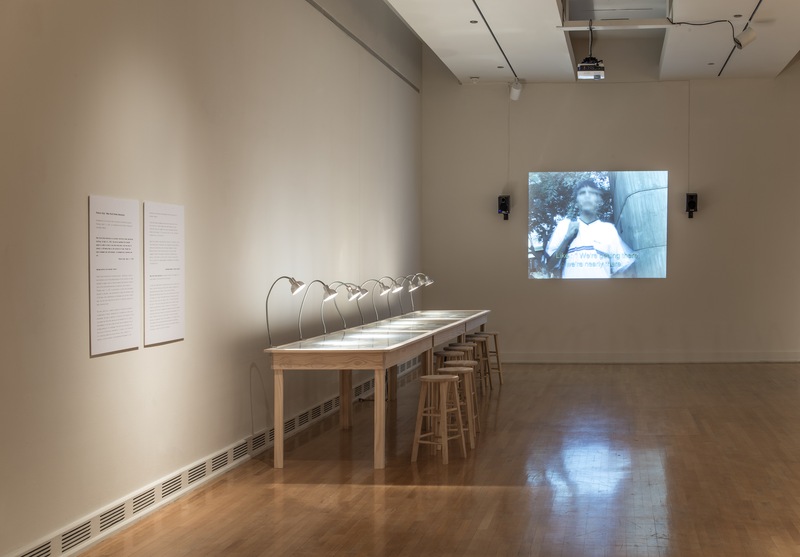 Part 1 of This Is Not America will close on Nov. 9, 2013, with Part 2 on view Nov. 16 2013 – March 15, 2014, and Part 3, co-curated with ASU MFA students, up from March 22 – June 6, 2014. Artists include Facundo Arganaraz, Sandow Birk, Los Carpinteros, Juan Capristan, Enrique Chagoya, Binh Danh, Kota Ezawa, Eamon Ore-Giron, George Grosz, Ana Teresa Fernandez, Jon Haddock, Alfredo Jaar, Michael Lucero, Carrie Marill, Sanaz Mazinani, Ranu Mukherjee, Georgia O’Keeffe, Gina Osterloh, Raymond Pettibon, Michele Pred, Ken Price, Jerome Reyes, Paul Rucker, Rene Francisco Rodriguez, Fernando Rodriguez, Lorna Simpson and Adriana Varejão. 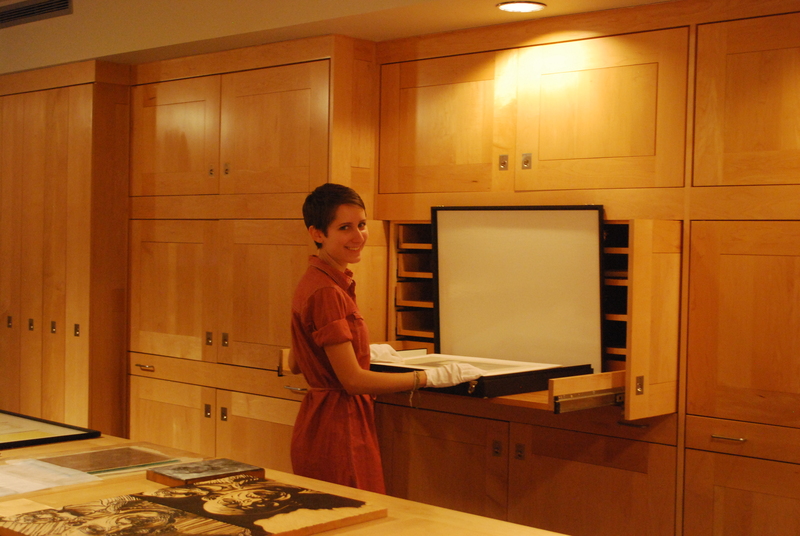 ASU student intern Emma Ringness at work in the Jules Heller Print Study Room at the ASU Art Museum, Spring, 2013. ASU School of Art senior Emma Ringness, who will graduate this December with a degree in printmaking, worked with ASU Art Museum curator Jean Makin to put together the exhibition Plate • Silk • Stone: Impressions by Women Artists from the ASU Art Museum Print Collection, which is on view at the Museum through Dec. 8. In these figurative prints selected from the permanent collection, women artists take on social and domestic issues, as well as themes of history, culture and identity. For more information about the show, click here. For printmaking nerds like myself, there is no denying the thrill of sitting down to work next to a famous print by the French satirical printmaker Honoré Daumier, or viewing Roy Lichtenstein’s interpretation of the Oval Office on a daily basis. But enough with the nerdiness: Last year I had the pleasure of serving as a research intern in the ASU Art Museum’s Jules Heller Print Study Room under its director, Jean Makin. This glorious place is home to the museum’s print collection (including that Daumier and Lichtenstein), and is heaven for print nerds and art appreciators alike. As part of my internship, my job was to curate an exhibition of prints by women artists in the collection. This meant going through the many drawers and cabinets in which the collection is stored and getting hands-on with prints from the 16th century to today. It was a humbling experience, and for the first time made me feel connected to something bigger than myself as an artist: both to a long line of female printmakers, and to a cultural discourse in which I am a participant. Through the process of handling the work, selecting pieces for the show, researching and writing about the artists, I was also given a perspective other than that of the creator — of someone who maintains artwork for future generations. I now fully understand the long-term care and storage required by the print medium, as well as the amount of time and energy invested by museum professionals and art historians to research and share with the public the history and social relevance of work created through the print processes. This perspective shift has, in turn, altered my approach as a creator. The beauty of having an institution like the ASU Art Museum is that this unique learning experience was available to me on campus, and during my undergraduate education — rather than during graduate school or beyond. I am so grateful to Jean Makin for giving me this opportunity, and to the many people who make the museum’s collection available to the public on a regular basis. Each piece in the exhibition Turn off the Sun, on view at the ASU Art Museum through Sept. 7, packs tremendous heat, power and impact. Drawn from La Colección Jumex in Mexico City, an incredible private contemporary art collection of about 2,600 works, Turn off the Sun displays two dozen of these searingly honest and beautiful pieces. This is only the second time that any of the Jumex collection has been shown in the United States. The exhibition title did not come about from a concentrated brainstorm though, but rather from joking about the weather. During Jumex director Patrick Charpenel and curator Michel Blancsubé’s site visit to the ASU Art Museum in the summer of 2012, the two started an ongoing joke about how someone needs to “turn off the sun.” When curator Julio César Morales joined the staff in the fall and heard it, he pointed out how that’s not necessarily a joke—that’s a great name. “When I heard this phrase, I thought it was a brilliant title, and the more it was discussed by myself and Heather Sealy Lineberry, the more we thought the title really connected with artworks in the exhibition and addressed ideas of site, adaptability and physical displacement,” Morales said. ASU Art Museum senior curator and associate director Heather Sealy Lineberry said the museum staff became interested in the social and political implications of brining the contemporary art collection from Mexico to Arizona and how the content of the work would shift just by the very nature of having it here. The artworks address several types of issues between Mexico and the United States, among them borders, landscape, lines, labor, politics, economics, faith and awareness. One example is “Cuando La Fe Mueve Montañas” (“When Faith Moves Mountains”) by Francis Alÿs, a conceptual performance artist. In the multimedia installation, the artist has a group of people move a mountain with shovels to create a line, like a curious border. 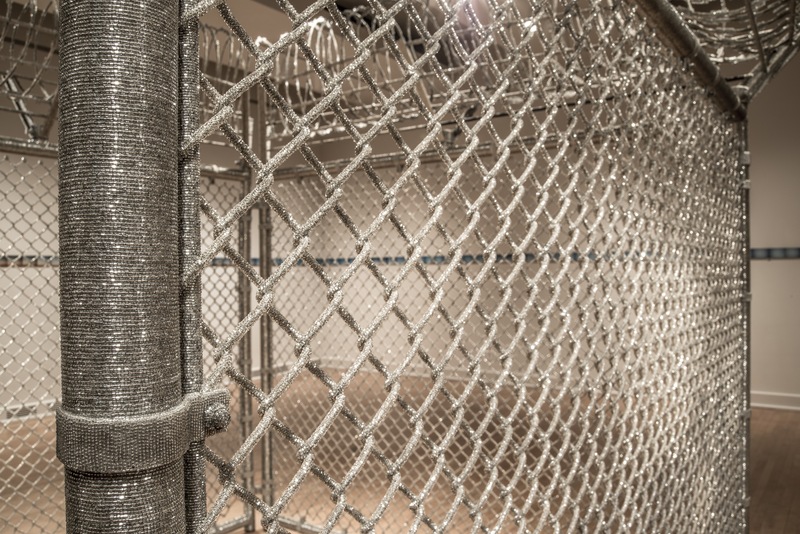 Another is “Security Fence” by Liza Lou, which explores dark psychological spaces of violence and confinement. Santiago Sierra’s artwork “3000 holes of 180 x 50 x 50 cm each” is a triptych of three photographs and a performance piece that he created while in southern Spain, looking across to North Africa where many immigrants come into Spain. On video Sierra highlights matters of struggle and immigration by showing the 3,000 shoveled holes, mostly dug by Senegalese and Moroccan day workers over the course of a month with a Spanish foreman overseeing the labor. “These three pieces pulled at our imagination and were tremendous anchors for what we wanted to do with the exhibition,” Lineberry said. Along with the choosing of the exhibition title, another unexpected aspect of Turn off the Sun is that there are no labels next to the pieces. Instead, there is printed material at the entrance of every gallery space that includes technical information, biographies and further text about the artistic process of all the artworks. This allows people who want to make their own relationships with the work to have that possibility. With each exhibition, the museum experiments with how to provide information for the visitor, and different kinds of exhibitions warrant different information systems. Though some visitors are more comfortable with text panels, many are pleasantly surprised and enjoy the practice of making their own connections with the works. Images, from top: “Overpass,” by Jeff Wall; “Cuando La Fe Mueve Montañas” (“When Faith Moves Mountains”), by Francis Alÿs; “Security Fence,” by Liza Lou, and “3000 holes of 180 x 50 x 50 cm each,” by Santiago Sierra. All photos by Craig Smith. 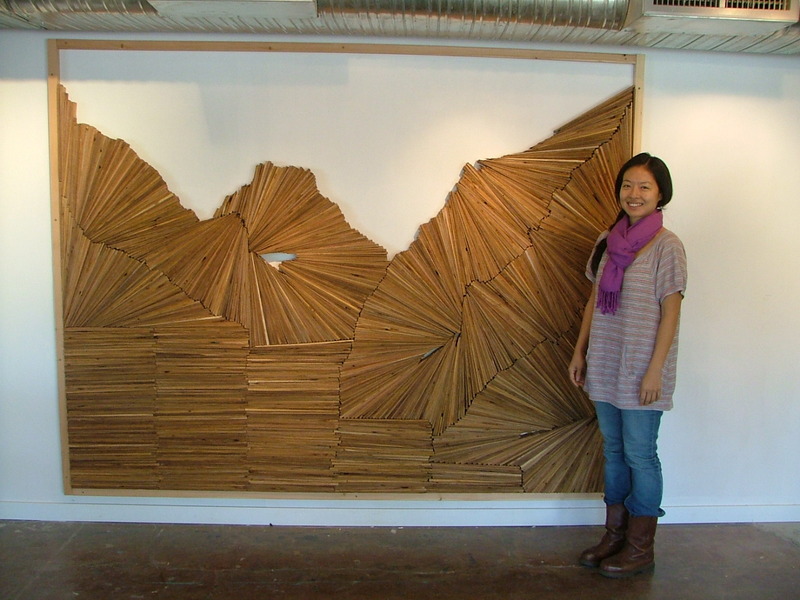 Visiting artist Christine Lee stands next to one of her pieces at the gallery at Combine Studios, in downtown Phoenix. Photo by Elizabeth Kozlowski. Christine Lee takes in the disregarded, salvages the thrown away and harbors the excess. For this wood-based artist, the original intention of a material is only a hint of a much more meaningful possibility, making Lee’s artwork a process-driven venture and a thorough material investigation. Lee’s work crosses back and forth between sculpture, furniture, woodworking and installation. As part of the ASU Art Museum’s Crafting a Continuum series, Lee has given public lectures, taught classes and installed her own work at Combine Studio in downtown Phoenix. The Crafting a Continuum series is sponsored by a Windgate Charitable Foundation grant, which has enabled the museum to attract and support craft-based visiting artists, such as Lee, who incorporate new ideas and technologies into their artwork. 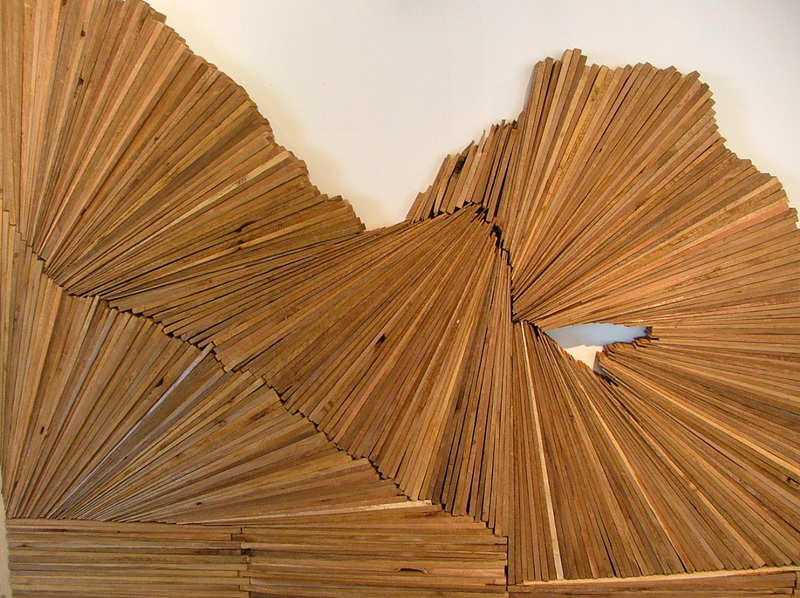 Last month Lee put together Piece by Piece, an exhibition at the ASU International Artist Residency facility at Combine Studios, in downtown Phoenix, for which she stacked slender individual pieces of wood to fan out over an entire wall. No glue, no nails — just balance. This wasn’t her first endeavor for a project like this, however. In other galleries she has created similar works on walls, spanning up to 26 by 12 feet. A closer look at Lee’s work. Photo by Elizabeth Kozlowski. As part of her residency Lee taught a class for the Fall 2012 semester — ART 494/598, Sustainable Wood Art, an upper division seminar in the wood program of the Herberger Institute for Design and the Arts — which she is teaching the Spring 2013 semester as well. Lee’s students use composite boards formed by collecting sawdust and fibers and putting the raw materials into processing chambers. Prototypical, a show on view in December and January in Wrigley Hall, home to ASU’s Global Institute of Sustainability and School of Sustainability, highlighted work Lee’s students made using a patent-pending interior composite panel developed by Lee and research engineer John F. Hunt of the USDA Forest Service, Forest Products Laboratory. The panels are naturally bonded without an adhesive binder such as urea or phenol formaldehyde and are biodegradable. What Lee enjoys most about teaching is watching her students as they grow to understand the process and connect with what they make. “Teaching for me is really exciting because I like the dynamics between interacting with people who are very excited about learning something new, and I also like watching them kind of see that transformation of material happen,” she said. Lee at Combine Studios, in downtown Phoenix. Photo by Elizabeth Kozlowski. Romney added she feels privileged to have taken a class under Lee’s direction, and she hopes Lee makes Arizona a permanent home. 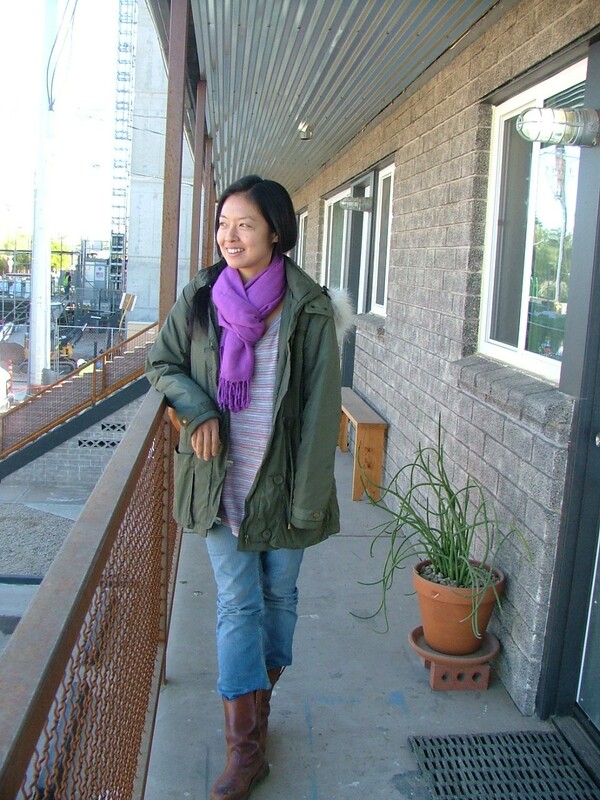 During her time in Phoenix and Tempe, Lee has found a wealth of possibilities. 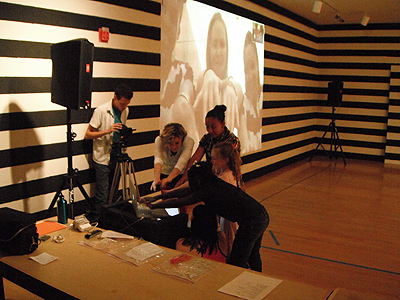 To see more images of Christine Lee’s show at Combine, visit the ASU Art Museum International Artists Residency at Combine Studios Facebook page. On Friday, Feb. 8 we celebrated the season opening for our spring shows: Cu29: Mining for You, a collaboration between Matthew Moore (Phoenix) and Clare Patey (London); Traces of Japanese Life: Selections from the Melikian Collection; and, at the Ceramics Research Center, Born of Fire: The Pottery of Margaret Tafoya and a companion show, Re: Generation: A Survey of Margaret Tafoya’s Descendants. We also said farewell to artist-in-residence Miguel Palma, from Portugal, whose exhibition Trajectory closed Feb. 9. Thanks to everyone who made the shows possible — to the hard-working artists, to our donors, to our magnificent staff and advisory board, and to Target and Tempe’s own Cornish Pasty, for helping make it such a great party. Coming up on March 22: The opening of Turn off the Sun: Selections from la Colección Jumex. Be there! 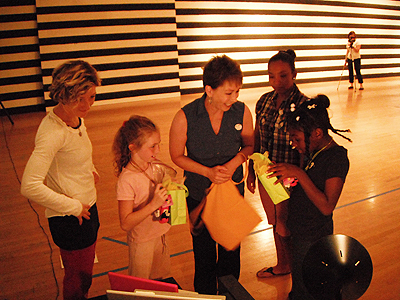 Above: Elizabeth Johnson, second from left, takes part in the “Mother-Daughter Distance Dance” at the ASU Art Museum on April 2, 2011, as part of Gregory Sale’s exhibition It’s not just black and white. Art is active. And for those like Elizabeth Johnson, it can move them in more ways than one. As the Coordinator for Socially Engaged Practice at the museum, Johnson uses dance in order to organize collaborations, promote dialogue, and investigate pressing issues of our time. Part of how she does this by harnessing people’s natural movement and putting shapes around questions that people then answer physically. It’s not as abstract as you might think. Before accepting this position, Johnson had never worked for a museum before. Having received her BFA in Dance from Connecticut College, Johnson traveled around the world organizing community engagement events and projects, as she says, in everyone’s community except her own. Johnson’s work uses unique activities to connect with the community and have people think about artmaking and relationships formed through art. She bases her work on the idea that intangible social interactions can constitute the core of an artwork. Through dance, Johnson creates meaningful cross-disciplinary collaborations and builds sustainable partnerships. Johnson is currently pursuing an MFA in Dance from ASU with her thesis focusing on exploring women and crime, a subject she became interested in after collaborating with Gregory Sale for It’s not just black and white in 2011. Johnson considers curriculum integration the biggest and most important aspect of her job — how to create a program that trains the artists of the 21st century that gives them skills to not only hones their craft but apply it in multiple contexts. Johnson currently instructs Socially Engaged Practice: Engagement and Community, but she is also in the process of designing a new program and curricula for a certificate in Socially Engaged Practice at the undergraduate and graduate level. Next semester she and the director of the ASU Art Museum Gordon Knox will teach the new class Socially Engaged Art, which will examine the role of the artist in society from an anthropological perspective. Knox and Johnson also plan to use the course to push students to think about how to use art to moderate conversations and assess the complexities of a given social situation. Johnson’s intern Lindsay Henika, a senior studying Art Administration, has found her time at the museum to be an opportunity to learn about special event planning and media marketing. “It’s been so great to see how the museum works from the front row,” she says. Johnson has her hand in many different projects, but her next upcoming event is At Home in the Desert: Youth Engagement and Place. The project partners the faculty and staff in ASU Herberger Institute for Design and the Arts with community-based organizations, The Boys & Girls Clubs of Metropolitan Phoenix, The Boys and Girls and Club of the East Valley, Girl Scouts—Arizona Cactus-Pine Council, and South Mountain High School. Johnson has been working with the Girl Scouts by studying the desert and making dances about what they find. The public event will take place on Dec. 1 at the Diane and Bruce Halle Skyspace Garden on the Tempe campus at 4:30 p.m.
To learn more about what the Socially Engaged Practice community is up to, check out its blog and Facebook. Click. A photo of desert scenery. Click. Another photo of the desert. Is that the same one? Click. Oh, another! Have I seen this one already? Click. And another? This one’s probably different. Click. Is it? It is. Click. The photos are projected onto a white wall by an old-fashioned slide projector set on a timer. The photos roll around, each a different photo of Arizona’s desert scenery. On the other side of the wall, there is an orange astronaut suit with one noticeable addition: several dozen small, black computer fans attached to the outside of the suit. Palma wore this suit as he traversed the desert, taking photos of the sights and scenery. The black computer fans were used to keep him cool during his expedition. “Bypass” is a device that Palma created. It takes water from a bucket, runs it up tubing into a chunk of wood, and then drips the water back down into the bucket. The natural and organic element of the wood and the water contrasts with the metal and silicone. There is a pump inside the bucket of water that looks like it was put there to bring water to the tree, but then the tubing and the metal cause the water to bypass the tree and return to the bucket. The manmade apparatus of tubing and silicone is depriving the tree of the water that it needs. The hunk of wood is supported in the air by metal and a hydraulic lift. The manmade system isn’t only depriving the tree of water, but it also supports the tree and holds it up. This brings up a question: is this what we’re doing to the desert? Are we trying our best to uphold it and support it, yet ultimately just depriving it of what it needs to survive? I arrive at more questions than I have answers. I have to move on. Along the northern and eastern wall, there is an absolute cascade of poster paper full of art and ideas. Each poster contains ideas about the desert and the culture of the people who live in it. Palma uses collages, images, drawings and commentary of our culture to show these ideas. As I walk and read each poster, I see themes connect and I begin to understand the corollaries between them. For example, Palma wrote about swimming pool shapes, and the purpose of each shape. He wrote about L-shaped pools. “The L-shape fits easily into a corner or around a house projection.” I see that phrase written multiple times around swimming pools and even around old desert photos where, presumably, a pool would eventually go. There are stories about the destruction of the desert, and how manmade tools changed the scenery into what we call Phoenix. I notice one piece called “War Games.” It shows photos of the desert, with yellow dots painted over it. Each dot has a line pointing at a construction truck, many with Xs drawn over them. Palma seems to be trying to show that people are at war with the desert; our weapons are the tools we used to put ourselves into the desert with, like tools of construction, transportation and infrastructure. I have never thought of it like that. Are we at war with the desert? Palma was a visitor to our desert, but it took me a while to connect the dots. He wasn’t just an explorer of the desert; he is implying that he is like an astronaut exploring unknown worlds with his space suit and his rover vehicle. It all became clear to me. His art is a tale of his exploration of the unknown territory, the Arizona desert. He charted our destruction of the desert as well; we have been using our war tools to build our L-shaped pools and destroy the beauty of the desert around us. Palma researched our history and recorded lives, not just our lives, but also the life of the desert itself. But what does that make me, a desert-dweller observing Palma’s observations? I suppose I’m the Martian who lives on this strange planet of rock and cacti. I suppose we should all take a better look at the world outside our cities. It’s beautiful. Thanks to Sean Deckert and the Desert Initiative for use of their photographs.